Players from United States don't accept. Sign up at PlayOJO Casino on our site to be able use the promos and coupon codes listed below. No bonuses are available for your country, please come back later or change the country! Cashout Time: E-Wallets up to 24 hours, Credit/Debit Cards 2 - 7 business days, Bank Transfers 2 - 7 business days. New for 2017, PlayOJO Casino is a fresh face in the iGaming industry that does more than promise its players a one-of-a-kind and out-of-the box rewarding playing experience. It has also taken an ambitious and revolutionary step forward by choosing not to be another "industry standard" cookie-cutter online casino. It has managed this feat by breaking away from conventional inconspicuous "small print" terms and conditions and by getting rid of wagering requirements. Yes, you read that correctly - there are absolutely no wagering requirements at this casino. With perks like money back on every bet, a variety of bonus opportunities and over 500 games from the online gambling industry's top talent, playojo.com aims to be one of the most successful casinos in the UK. As long as this unique brand manages to live up to its promises, it should have no trouble finding its success. What you will discover in this OJO review is that this brand doesn't only cater to one type of player. Whether you're a newbie, a causal weekender or a gaming guru, this internet and mobile casino brings something to the table for everyone. It doesn't matter if it's great games you're after, frequent rewards or non-stop thrills. PlayOJO delivers on all levels. Play OJO is powered by popular casino software supplier SkillOnNet and has been designed using the latest desktop and mobile platforms. It doesn't matter if you're seeking an Instant Play (Flash) gaming adventure or entertainment on-the-go. Play your favourite OJO games via your PC or MAC or access premium HTML5 PlayOJO casino mobile content via your iOS or Android smartphone or tablet. You can enjoy the best games in the safest and responsible environment, which is backed by 128-bit SSL (Secure Socket Layer) protection, ensuring all transferring of funds and sensitive information is kept locked down and private. What you see is what you get with OJO casino. This brand believes in fair play. Not just in terms of ensuring that games are tested and proven fair, but also in making certain that there is no hidden terms when it comes to bonuses. When OJO says it's just real money and real play, its meant in the literal sense. PlayOJO casino games consist of all the hottest games in the online casino industry. No corners were cut when this innovative brand created its diverse games library which features games from the industry's famous names like NetEnt, Microgaming and WMS. This means you'll find outstanding titles from each of these brilliant developers including games like: Starburst, Dazzle Me, Gonzo`s Quest, Jimi Hendrix, Guns N`Roses (NetEnt), Immortal Romance, ThunderStruck II, Ariana (Microgaming), and Rainbow Riches, Bruce Lee, Titanic, Michael Jackson King of Pop (WMS). In addition to these spectacular providers, PlayOJO games are also powered by other top providers including SkillOnNet, GVG, NextGen Gaming, Amaya, Microgaming, Barcrest, Blueprint Gaming and Merkur Gaming. With such a huge variety of awesome brands, it`s not surprising that OJO delivers a top quality gaming experience. The majority of the over 500 games and counting at this casino are composed of slots. You`ll find classic slots, video slots with huge bonus features, 3D games, branded gems and some of the most popular progressive jackpot slots like Microgaming's Mega Moolah and NetEnt's Mega Fortune. Aside from slots, there is a virtual table game offering that brings you multiple variants of Roulette and Blackjack. There is also a Live Casino powered by Novomatic's Extreme and Evolution Gaming. Via the live dealer games, you can enter an authentic gambling world that features actual human dealers where you can enjoy your favourite card and table games in a land-based betting environment in real time. 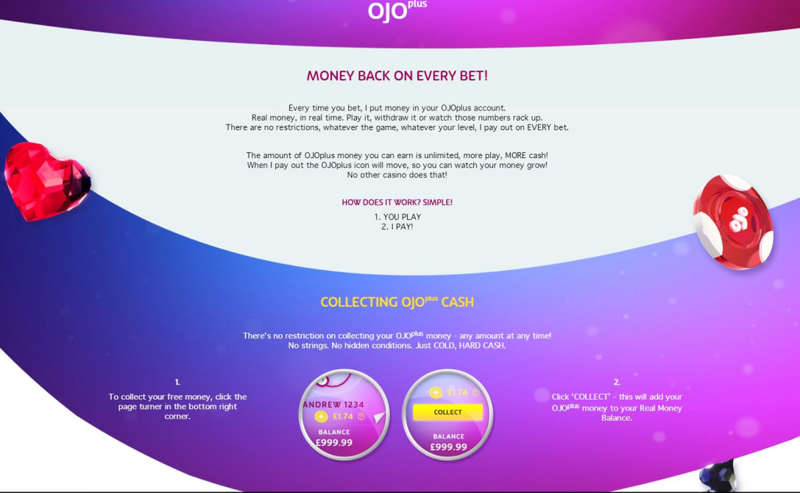 As was previously mentioned in this PlayOJO Casino review, OJO offers a uniquely rewarding experience that is without wagering requirements. That said, what types of PlayOJO Casino bonus and other perks can you expect from this brand? Check it out! To start, PlayOJO doesn't offer a standard welcome package or bonus offer. What they do offer is a Welcome Play Package that is far more special. You can get up to 50 Free Spins with no wagering requirements on your first deposit. 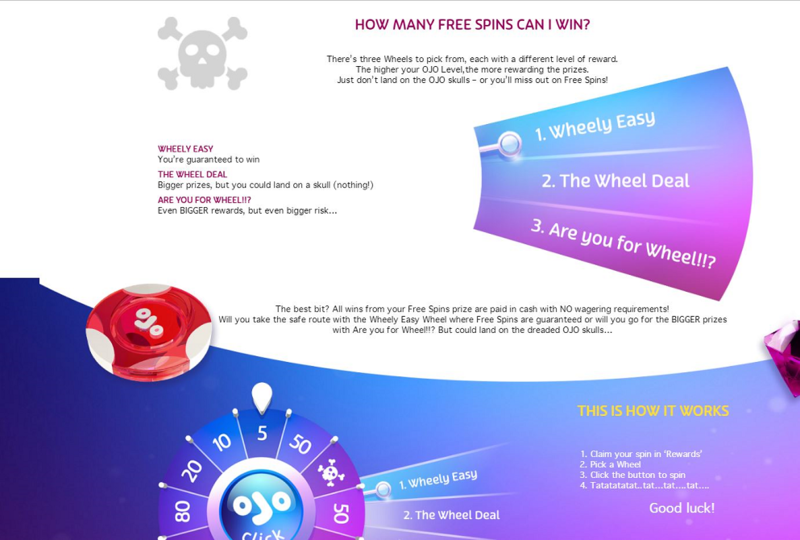 What makes this particular offer cool is that you're awarded 1 spin for every £1 you deposit. Therefore, it's up to you how many free spins you get. Deposit £5 and get 5 Free Spins. Deposit £35 and get 35 Free Spins. As the bonus terms state, you get 1 Free Spin for every £1 deposited up to 50 Free Spins. There's no guess work involved here and no hidden terms. Plus, your winnings are yours, wager-free! At OJO, you can claim daily rewards known as Kickers. These are special perks that give you the chance to get exclusive promotions and daily offers specially selected for you. They are different every day and they only last 24 hours, so you'll want to be sure to login daily to see what's up for grabs and make your claim! Beyond Kickers, you can also engage in live tournaments each day for a chance at even more rewards. 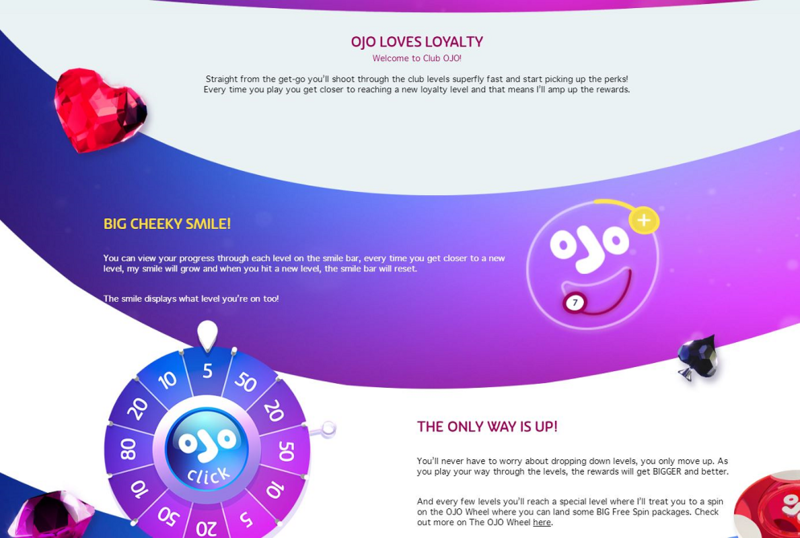 However, what truly makes OJO Casino stand out from the crowd is its specials like OJOplusand The OJO Wheel. 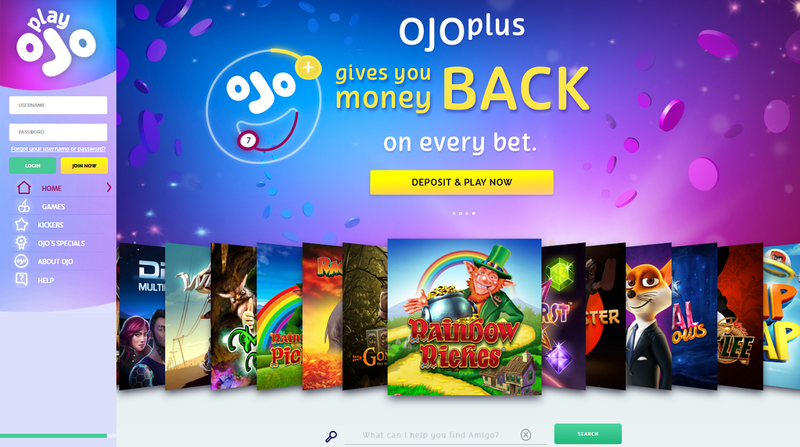 Every player has an OJOplus account and each time you bet, OJO puts money in this account. This is real money that you can accumulate, play with or withdraw. There are no restrictions, which means you get money back on every bet, regardless of the game you play and regardless of your player level. The amount of OJO cash you can earn is unlimited. The Big Wheel is another fun invention of OJO's. You'll get a spin on the wheel for your chance to win prizes like Free Spins when you reach a certain level or you may be awarded with a spin as a random treat. Either way, you'll be able to choose from 3 wheels of chance, with stakes growing higher with each wheel. Finally, Club OJO is PlayOJO's VIP experience. The club is all about awarding loyalty and all players can take part in the club and climb the levels to earn more perks. As an extra special bonus, when you're a part of Club OJO, you can never go down levels. You can only go up! PlayOJO Casino payment methods include a range of trusted and secure banking solutions ranging from major credit cards (Visa, MasterCard, Maestro, Solo/ Switch), to eWallets (PayPal, Skrill, ecoPayz, Neteller), prepaid cards (Paysafecard) and online banking (Citadel, Fast Bank Transfer). All deposits with the exception of Fast Bank Transfer are immediate. As for withdrawals, you can expect fast processing times and even same-day cashouts for methods like eWallets. Whenever you find you need to get in touch with the OJO crew, don't hesitate to contact the customer support staff via email, live chat and telephone. As cheeky and blunt as the casino may seem, support is friendly and professional and always ready to answer your concerns, questions or whatever else you might want or need to chat about. That being said, if you prefer trying the self-help route first, there is a detailed FAQ that will help to answer basic inquiries. If you're looking for a unique and gratifying online casino experience, give PlayOJO Casino a try. You're bound to find games you love and the incredible bonus features like OJOplus and the OJO Wheel will keep the rewards coming. PlayOJO Casino has supported play on mobile platform, you just hold your smartphone at the image area to get the direct link to PlayOJO Casino on your mobile. PlayOJO Casino has restricted from United States, but you can choose another casinos to play from your country. The bonuses are coming soon!